I wasn’t planning to review this gun, but since I’ve been using it in the last few videos, you guys have been asking a lot of questions about it, so today I’m going to deliver some answers. This is my Remington 870 12 gauge short barreled shotgun. It started out as a cheap surplus police shotgun that I bought with no barrel. If you look closely, you can tell that it’s pretty well used, but it’s in great mechanical condition. I replaced the stock with a Magpul SGA stock. I’ve removed all of the spacers in order to get the length of pull as short as possible and I’ve added one of the Magpul cheek risers to raise the comb height. The forend is also from Magpul. It’s actually not my favorite design — I’m not crazy about this lip here in the back, but I like that it’s really easy to attach a light. You can put a piece of rail on any of these slots on the forend and attach whatever light you want. I’ve got this Inforce WMLX attached here, which works pretty well with the way I normally grip the forend. The mag tube extension is the only accessory I kept that was on the shotgun when I bought it. It’s a Vang Comp Systems +1 extension, so I can get a total of five rounds in the tube. The side saddle is also from Vang Comp. It’s a plate with Velcro on it that attaches with screws through the receiver. These Velcro-backed cards with the elastic loops just stick right to the plate. The barrel is actually a Remington factory 14-inch barrel with a fixed modified choke. 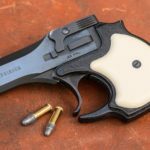 Remington doesn’t typically sell these to the general market, but you can sometimes find them on the auction sites. I got this one for a little under $200. It came with XS express sights pre-installed — they’ve got a v-notch rear and a big white dot on the front. I’m not a big fan of the XS sights on handguns, but I really like them for this shotgun. I’ve found them to be a lot quicker to use than a ghost ring and more accurate than a bead sight. The Remington 870 is probably the easiest platform to start with for a short barreled shotgun, because it doesn’t require any custom work and the factory barrels aren’t too hard to come by. Because this shotgun has a barrel under 18-inches, it does fall under the National Firearms Act regulations. That basically means I had to pay a $200 tax and do a bunch of paperwork and wait a few months for Uncle Sam to process all that before I could legally install this barrel. If you want to know more about how the whole NFA thing works, I’ll put a link to more information in the video description. But I think the more pressing question a lot of you have is whether I think the short barrel is worth the extra $200. That’s going to depend a lot on your individual situation, but I do think it’s got some pretty compelling advantages. I like the way the gun balances better versus a typical 18 inch barrel. It’s not a drastic difference, but it’s noticeable. It also doesn’t sacrifice much in terms of shot spread. I can easily keep all the pellets inside the vital zone of a target at 15 yards with Federal Flite Control 00 buckshot. Most importantly though, the short barrel on the Remington 870 SBS is a lot more maneuverable inside a house. I’ve done some dry practice at home and at the range with some obstacles set up and I was surprised at just how much easier it is to get around furniture and doors and that kind of thing. I’m not suggesting anyone try to go hunt bad guys and clear their own house alone. But even just staying put in one room, the shorter barrel is easier to work with and for me, it also makes the gun a little quicker retrieve from where I have it stored. There are some disadvantages to the short barreled shotgun. It’s got a shorter magazine tube than you can get with a longer barrel, and that means you have one or two fewer rounds of ammo capacity. 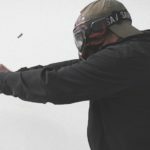 More ammo is certainly a good thing, but I’ve explained before why capacity is not nearly as critical with a shotgun as with a handgun or a carbine. The purpose of using a shotgun to solve a problem is precisely because historically, they haven’t required multiple hits to stop a threat. To paraphrase Tom Givens, if you’ve got five rounds in a shotgun, then you’ve got a “five bad guy gun.” And personally, I’m pretty happy with that. Capacity is not the only perceived disadvantage. 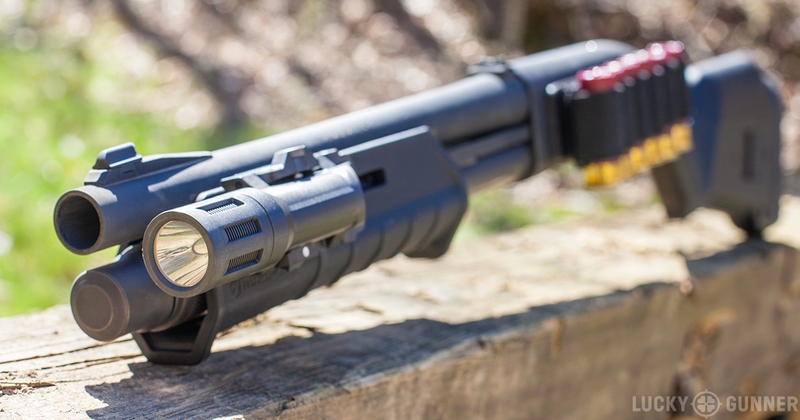 The short barrel may not be as PR friendly as a more typical shotgun and that might be a big deal for some people. You also have to fill out paperwork and get permission from the ATF any time you want to take a short barreled shotgun across state lines, which is kind of a pain if you travel a lot. Overall, for me personally, I think the benefits of the 14-inch barrel outweigh the potential disadvantages but it’s not what I’d call an essential modification. 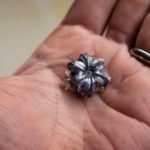 If you’ve already got a decent shotgun with an 18 or 20-inch barrel, your money is probably better spent on a few cases of ammo and a good training class. But if you’ve still got some room in the budget after that, I do think the short barrel makes the shotgun more convenient to use and might be worth considering.